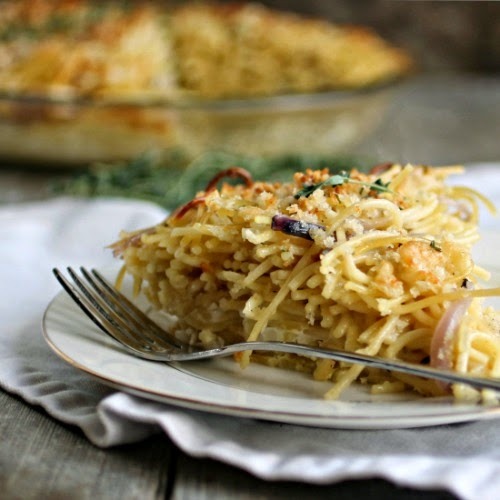 Spaghetti pie is typically a pasta baked in tomato sauce and cheese. It sounds good and has been on my to-do list forever now. But when I saw this French onion version in Good Housekeeping, my head turned. Sauteed onions in the pasta? My mom used to do that with egg noodles and I loved it. Gruyere cheese? One of my absolute favorites! White wine sauce? How gourmet! This had to be made ASAP. And so it was made and made again and I've tweaked it to my taste. My recipe also scales down the quantity since I'm not feeding a large crowd. Even so, I ended up with a generous amount and a new favorite to add to my dinner roster. Enjoy! Add the oil and sliced onions to a large skillet and saute on medium low heat for about 10 minutes or until the onions are translucent. Add the thyme and garlic and continue cooking for a couple of minutes until the garlic has softened but not browned. Add the tablespoon of butter and the white wine. Cook for a few minutes until the sauce has reduced by about half. While the onions are sauteing, cook the pasta in boiling salted water as per package directions. Drain and return to the pot. Fold in the onion mixture. 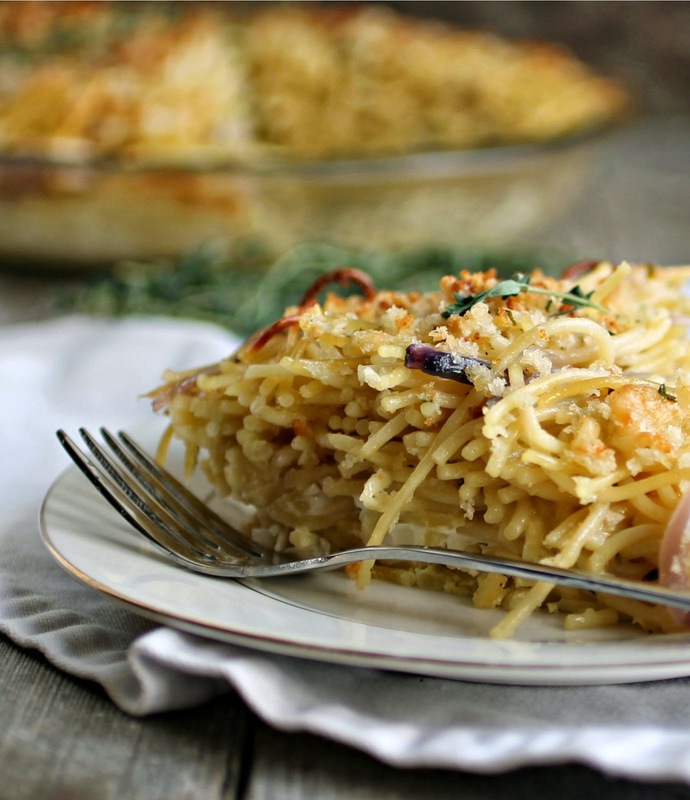 In a bowl, combine half the shredded cheese along with the breadcrumbs and melted butter. Stir to combine and set aside. In a separate bowl, whisk together the eggs, milk, other half of the cheese, salt and pepper. Mix into the spaghetti and onion mixture. Pour into a 9" pie or casserole dish and top with the breadcrumb mixture. Bake in a pre-heated 375 degree oven for approximately 30 minutes or until the eggs are set. Makes 4 generous servings. I love how this looks, Anita!! That looks really good. You could even use mushrooms and make a stroganoff pie! 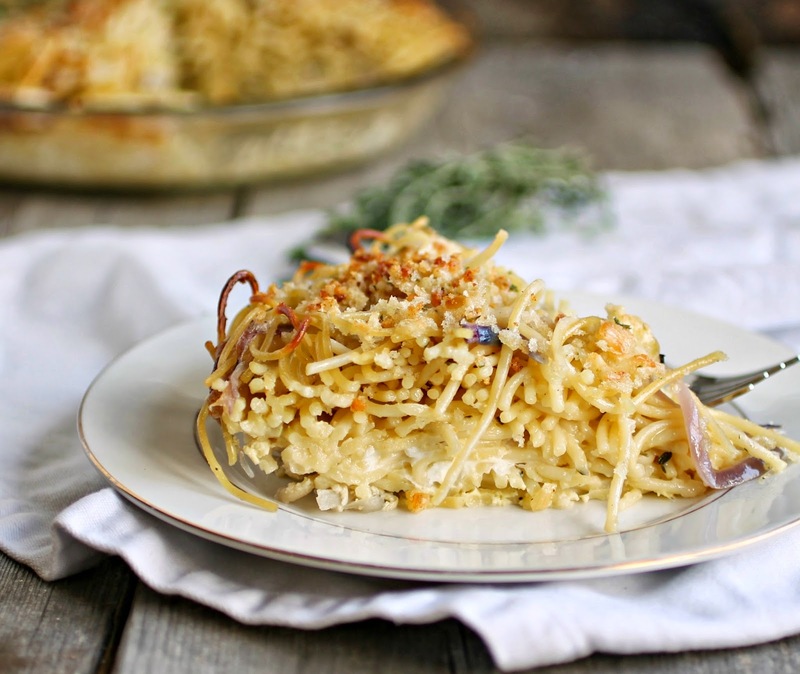 I discovered spaghetti pie rather late in life, but I'm a big fan. Your onion version looks terrific! A lovely meatless meal, too. YUM! 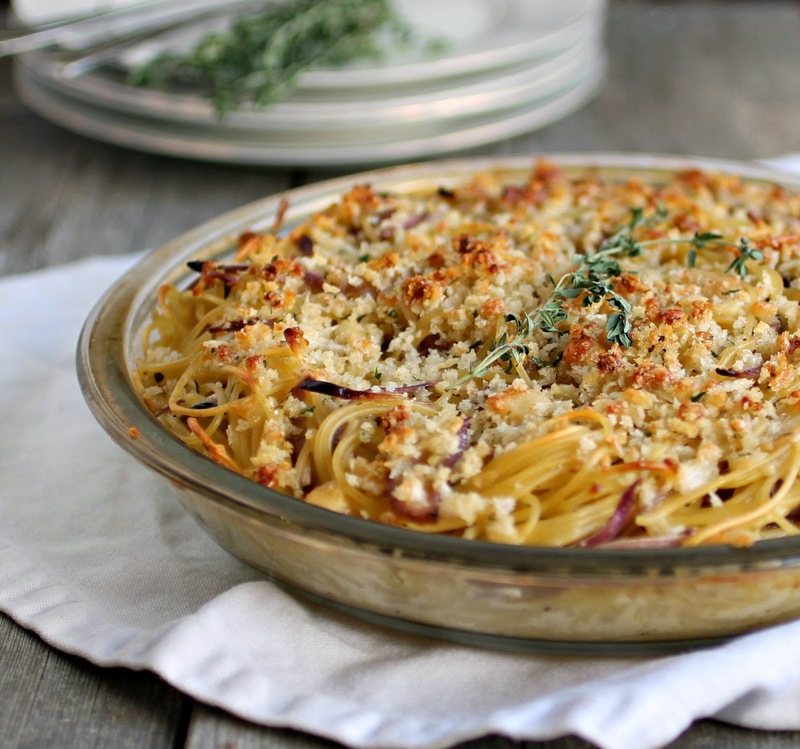 Pasta and onions - two of my favorite foods! That is just too much fun!!! Looks fantastic - this is my ultimate type of comfort food. I've never made a spaghetti pie of any sort, so I've got a lot of catching up to do! mmm i make soemthing similar, well in Italy we call it just a spaghetti frittata so with a lot more eggs!